Charles Alvin ("Charlie") Beckwith (January 22, 1929 – June 13, 1994), known as Chargin' Charlie, was a career U.S. Army Special Forces officer best remembered as creating Delta Force, the premier counter terrorism and asymmetrical warfare unit of the U.S. Army, based on his experience serving with the British Special Air Service. He served in the Malayan Emergency and the Vietnam War, and attained the rank of colonel before his retirement. Beckwith was born in Atlanta, Georgia on January 22, 1929, to parents Elza Dozier Beckwith (1894–1940) and Clara Eugenia Beckwith (née Rey; 1895–1973). He was an all-state football player for his high school team. He later enrolled in the University of Georgia, where he was a member of the Delta Chapter of the Sigma Chi Fraternity, and ROTC. Beckwith lettered in football for the Bulldogs, and was approached by the Green Bay Packers for the 1950–51 NFL draft, but turned it down in favor of a military career. He was commissioned as a Second Lieutenant in the U.S. Army in 1952. After the Korean War (1950–1953) was over, then-2nd Lieutenant Beckwith served as a Platoon Leader with Charlie Company, 17th Infantry Regiment, 7th Infantry Division in South Korea. In 1955, Beckwith was assigned to the 82nd Airborne Division as the commander of the combat support company of the 504th Parachute Infantry Regiment. Two years later, after also having completed Ranger School, Beckwith joined the Special Forces in 1958 assigned to the 7th Special Forces Group. In 1960, then-Captain Beckwith deployed to Laos for two years on Operation Hotfoot. In 1962, Beckwith was sent as an exchange officer to the British 22 Special Air Service Regiment (SAS) where he commanded 3 Troop, A Squadron. He conducted war-time guerilla operations with the SAS during the Malayan Emergency in Malaya. In the jungle, he contracted a case of leptospirosis so severe that doctors did not expect him to survive. However, he made a full recovery within months. Upon his return from England, Beckwith presented a detailed report outlining the Army's vulnerability in not having an SAS-type unit. For several years, Beckwith (who was still a Captain) submitted and re-submitted the report to Army brass, only to be repeatedly thwarted in his efforts. Special Forces leadership at the time thought that they had enough on their hands and did not need the trouble of creating a new unit. Meanwhile, as the 7th SFG(A) operations officer, Beckwith went to work revolutionizing Green Beret training. Special Forces at the time focused on unconventional warfare, and especially foreign internal defense: i.e. training indigenous personnel in resistance activities. But Beckwith recognized that, "Before a Special Forces Green Beret soldier could become a good unconventional soldier, he'd first have to be a good conventional one... Because I had commanded rifle and weapons companies, I was appalled on arriving in Special Forces to find officers who had never commanded conventional units." Beckwith restructured 7th's training, basically rewriting the book on Army special operations training from the real-world lessons he had learned with the SAS. Beckwith also had learned that a symbol of excellence like a beret had to be earned. Officers were being assigned to Special Forces straight out of war college with no prior special ops experience and were given their Green Beret on arrival. The hard-nosed and practical training standards that Beckwith instituted would lend themselves to the birth of the modern Q-Course. 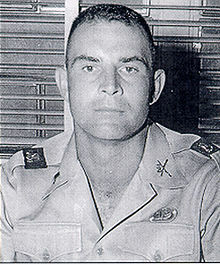 In 1965, Beckwith volunteered to return to Vietnam where he was selected to command a high-priority special forces unit Project Delta (Operational Detachment B-52). He used his SAS experience to test and select men for long-range reconnaissance operations in South Vietnam. Following his promotion to Major, Beckwith led B-52 in the rescue of the besieged Special Forces camp at the Siege of Plei Me. He was critically wounded in early 1966 (he took a .50 caliber bullet through his abdomen). It was so bad that medical personnel triaged him as beyond help for the second time in his military career. This time, again, Beckwith made a full recovery and went on to overhaul the Florida Phase of the U.S. Army Ranger School. Beckwith transformed this phase from a scripted exercise based upon the Army's World War II experience, into a Vietnam-oriented jungle training regimen. In 1968, following the Tet Offensive, then-Lt. Col. Beckwith returned to Vietnam, taking command of the 2nd Battalion, 327th Infantry (Airborne), 1st Brigade, 101st Airborne Division. For the nine months that he commanded the 2/327 (“No Slack”), they saw many successes in combat operations, including: Huế, Operation Mingo, Operation Jeb Stuart, Operation Nevada Eagle (clearing the Huế-Phu Bai area), and Somerset Plain (sweeping the southern portion of the A Shau Valley). The toughest job the battalion had was clearing a seven kilometer stretch along Route 547, running west of Huế, eventually defeating the determined NVA defenders so that Fire Support Base Bastogne could be established. From 1973 to 1974, Lt. Col. Beckwith served as commander, Control Team "B" with the Joint Casualty Resolution Center (JCRC) located at RTAFB Nakhon Phanom, Thailand. Under the Command of BG Robert C. Kingston, USA, JCRC's sole mission was to assist the Secretaries of the Armed Services to resolve the fate of servicemen still missing and unaccounted for as a result of the hostilities throughout Indochina. JCRC had a predominantly operational role—the carrying out of field search, excavation, recovery, and repatriation activities. He was promoted to Colonel and in 1975 returned to Fort Bragg, North Carolina as the Commandant of the U.S. Army Special Warfare School. Although Beckwith had presented proposals throughout the 1960s for a superbly elite, highly autonomous direct-action unit, the idea had sat on the shelf for a decade. Finally, in the mid-'70s, as the threat of international terrorism became imminent, Beckwith was appointed to form his unit. 1st Special Forces Operational Detachment-Delta was then established on 17 November 1977, by Beckwith and Colonel Thomas M. Henry, as a counter-terrorism unit based on the model of the British Special Air Service, but with a greater focus on hostage rescue in addition to covert operations and specialized reconnaissance. Col. Beckwith led Delta Force's first mission, Operation Eagle Claw, the assault on the captured American embassy in Tehran, Iran early in 1980. The mission was aborted due to helicopter failures during a sandstorm and a subsequent crash which led to several deaths. After the 'debacle in the desert,' the 160th Special Operations Aviation Regiment was formed to provide transport for Delta Force and other special operations units. JSOC was also formed, directly based on Beckwith's recommendations during Senate investigations into the mission's failure. Beckwith was married to Katherine Beckwith, and they had three daughters. Following his disappointment at the failure of the Iranian operation, Beckwith retired from the Army. He started a consulting firm and wrote a book about Delta Force. In 1994, he died at his home of natural causes. Beckwith's remains are interred in the Fort Sam Houston National Cemetery, San Antonio, Texas. ^ a b c d e f g h i j k l m n o p q r s "Distinguished member of the special forces regiment – Colonel Charles A. Beckwith" (PDF). United States Army Special Operations Command. 13 December 2012. Archived from the original (PDF) on 21 December 2016. ^ Beckwith, Knox & Mobley 2000, p. 36. ^ Beckwith, Knox & Mobley 2000, p. 48. ^ Beckwith, Knox & Mobley 2000, p. 52. ^ Beckwith, Knox & Mobley 2000, p. 352. ^ Goolsby, Denise (14 July 2016). "Palm Springs man was Army Delta Force co-creator". The Desert Sun. Gannett. ^ Beckwith, Knox & Mobley 2000. ^ a b "Col. Charlie Beckwith, 65, Dies; Led Failed Rescue Effort in Iran". The New York Times. June 14, 1994. Retrieved April 28, 2010. Beckwith, Charlie A; Knox, Donald; Mobley, C A (2000). Delta Force: the Army's Elite Counterterrorist Unit. New York: Avon Books. ISBN 978-0380809394.